← It’s the simple things. Bella had a great birthday…or should I say, birthMONTH. We celebrated on the actual day (September 2nd), had a party on the 11th, and finally, an in-school celebration last week. Fun, fun, fun! 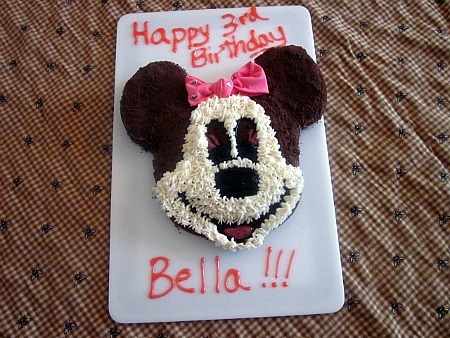 Using this cake pan, along with a little pink, I transformed Mickey into Minnie. I used a boxed mix (chocolate, but you can use whatever you like) for the cake, Wilton’s icing recipe (see recipe below) crushed chocolate cookies and pink and black colored gels on top. The white part is icing that was applied with a star tip. For the ears and top/sides of the face, I decided to use cookie crumbs instead of coloring the frosting black because, well, we all know how messy black frosting can be. So, I spread a thin layer of the frosting on those areas, which helped the crumbs stick to the cake. It worked out well – I also think it’s better because it gives it different texture, too. I used the black gel for her eyes, the outline of her nose, and her mouth. I filled her nose in with cookie crumbs. Then, I used the pink gel for her eyelashes and tongue. Add a bow, and there you go! 🙂 The perfect Minnie birthday cake. This was for her family party (it served around 20)…we really enjoyed it. 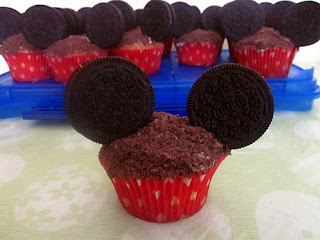 As for the cupcakes, I saw this cute idea and became inspired. I actually found red liners with white polka dots, so I didn’t have to make my own. After icing the cupcakes (same recipe I used for the cake, and this time, I used yellow cake mix), I sprinkled chocolate cookie crumbs on top. Then, using toothpicks, I stuck the “ears” on (Oreos). I didn’t have one, but if you have a small round cookie cutter, I recommend using it to cut the cookies before adding them to the cupcakes. Otherwise, as you can see, the ears look a little big, lol. I dropped these off at school for her class party…the teachers told me they were a big hit with the kids. Now, someone, please tell me – where did my baby go? In a mixing bowl, combine shortening and butter. Mix until fluffy, then add vanilla. Add sugar, one cup at a time, at medium speed. Make sure to scrape sides of bowl often. Icing will appear dry after all sugar is added. Add milk and beat at medium speed until light and fluffy. Refrigerate until ready to use (can be stored in fridge for 2 weeks) in an airtight container. Rewhip before using. This entry was posted in Annabella, cake, chocolate, cupcakes, family. Bookmark the permalink. 8 Responses to For my favorite 3 year old! What cute treats! Happy birthday to Bella! What a fabulous cake and cupcakes!! Great job mama Melissa! Your cake is adorable! I’m sure Bella loved it!